We’ve been reading quite a number of statements and reports coming from every direction (including our own gay blog) in the wake of the shootings of Congresswoman Gabrielle Giffords and a federal judge by 22 year old gunman Jared Lee Loughner. And quite frankly, we are deeply disturbed at how disdainfully Palin’s camp is treating the incident. Palin’s connection to the incident is well documented at this point. The former governor of Alaska listed Rep. Giffords name and congressional district in a gun’s crosshairs on her Takebackthe20 site. Palin has frequently used gun-crazy language in her campaigning. One need only take a glance at her Twitter feed for the proof. Immediately following the shooting of Rep. Giffords, but before it was known that a 9 year old girl born on 9/11 and a federal judge were also shot and killed along with others in the attack, Palin or her camp removed the image of Gifford in crosshairs from her site. After the media began correctly pointing out that Palin bears political accountability for her dangerous rhetoric and poor taste, conservatives went on the defensive. Excuse me? The media and the left are creating the potential for violence by pointing out that Palin and conservatives have been creating the potential for violence? Come again? Palin’s camp added that she was not responsible, and that the gun’s crosshairs used in the graphic on her site weren’t crosshairs at all, but surveyor marks. “We never ever, ever intended it to be gun sights”, said a Palin aide. It Gets Better creator, Dan Savage points out Palin’s pants are on fire. Ms. Palin and her staff are lying. Again, her Twitter feed has the proof. Why at this point is the media even floating the possibility that Palin is without fault in creating a climate that encourages crazed gunmen to attack elected officials? 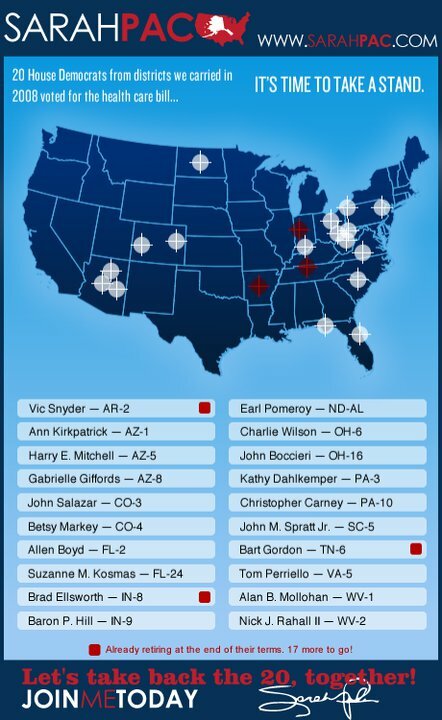 Documentary filmmaker Michael Moore yesterday tweeted, “If a Detroit Muslim put a map on the web w/crosshairs on 20 pols, then 1 of them got shot, where would he b sitting right now? Just asking.” It’s hardly eloquent, but he’s absolutely correct. A Unicorn Booty reader posted on our Facebook wall after our original report on the shooting, “Palin didn’t pull the trigger, but Osama didn’t fly the planes.” People are clearly seeing an obvious accountability and connection here that Palin’s camp is frantically denying exists. Well, guess what? Someone DID interpret it as violent. Half the country has! Whether or not the gunman did as well is unknown at this time. It may be in time. That hardly absolves Palin of accountability. Palin’s ignorance to perceive her own rhetoric as violent and dangerous doesn’t make her innocent! Conservatives, and Palin supporters suggesting that we are the dangerous ones for rightfully pointing out that she has been using violent language for political gain is quite frankly insane.